Community Rating: Under ObamaCare, the age-rating is 3-to-1, which means that a health insurer can charge older enrollees only three times more than younger enrollees. The American Health Care Act proposes changing the age-rating to 5-to-1. The amendment would allow a state to seek a waiver to expand the 5-to-1 age-rating ratio. The waiver for age-rating would apply for plan years beginning on or after January 1, 2018. A state would be allowed to seek a waiver to allow insurance companies to take the health status of enrollees into account, which was prohibited under the Affordable Care Act, provided that a state meets certain requirements to protect high-risk consumers. The waiver for health status would apply for plan years beginning on or after January 1, 2019, or, in the case of a special enrollment period, for plans in the 2018 plan year. Insurance companies would still be prohibited from taking the gender of an enrollee into account when determining premiums for an enrollee. This is a provision of the Affordable Care Act that will remain in place under the MacArthur amendment and the American Health Care Act. Essential Health Benefits: A state would be allowed to seek a waiver to define its own essential health benefits under the Affordable Care Act. The waiver would apply for plan years beginning on or after January 1, 2020. Default Approval: The waiver would automatically be approved after 60 days after the date of submission unless the state receives notification of rejection from the Secretary of the Department of Health and Human Services. The application must state the period for which the waiver will be in effect. If the state is seeking a waiver or waivers for age-rating and essential health benefits, the state must specify the higher ratio desired and/or its defined essential health benefits. If the state is seeking a waiver to allow insurance companies to take the health status of enrollees into account, the state must either have an established high-risk pool/risk-sharing program, or participate in the Federal Invisible Risk Sharing Program established by the American Health Care Act. The Federal Invisible Risk Sharing Program would be created by the amendment offered by Reps. Gary Palmer (R-Ala.) and David Schweikert (R-Ariz.). Length of the Waiver: Any waiver granted to a state can last up to ten years. States could seek a continuation of the waiver, which would be automatically approved after 90 days unless the Secretary of the Department of Health and Human Services rejects the request. A waiver for health status can be rescinded if the state no longer has an established high-risk pool/risk-sharing program, or participate in the Federal Invisible Risk Sharing Program. There are concerns with the text of the amendment, which, ostensibly, functions as an amendment to the Affordable Care Act, and, therefore, cannot be considered repeal of the community rating and essential health benefits. The amendment represents a perverse form of “federalism” that continues to perpetuate federal health insurance regulation. But the question is, does this approach represent a better policy option than current law? Yes, provided the process for which a state may apply for a waiver is not burdensome. It is unclear, however, who would be responsible for seeking a waiver. Some states may leave the ability to seek a waiver up to a governor. Others, though, may require state lawmakers to act. The waiver for essential health benefits, should states take this avenue, could create a flurry of activity in state legislatures, as lobbyists seek to ensure that special interests’ favored health insurance mandates are included. Additionally, the latitude afforded to the Secretary of the Department of Health and Human Services to determine the time and manner in which the waiver application may be submitted could create burdens for states in an unfriendly administration. 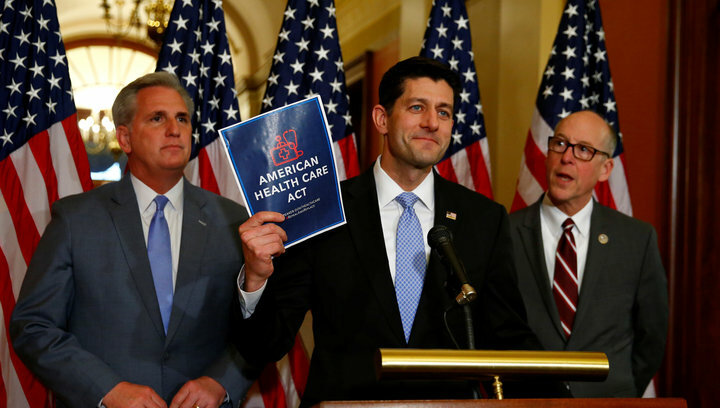 Still, the amendment is a step forward in the negotiations over the American Health Care Act and could bring the bill closer to the votes needed to send the bill to the Senate.